Robotics and automation technology is an important subject within higher-education institutions in India and not only in Germany. The governments of the two countries are working together intensively in order to boost research in these areas. In response to the Indian government’s search for simple robot systems for teaching purposes, robolink, the cost-effective modular system from igus, was so convincing that over 80 robolink arms for 40 Indian educational facilities were ordered. 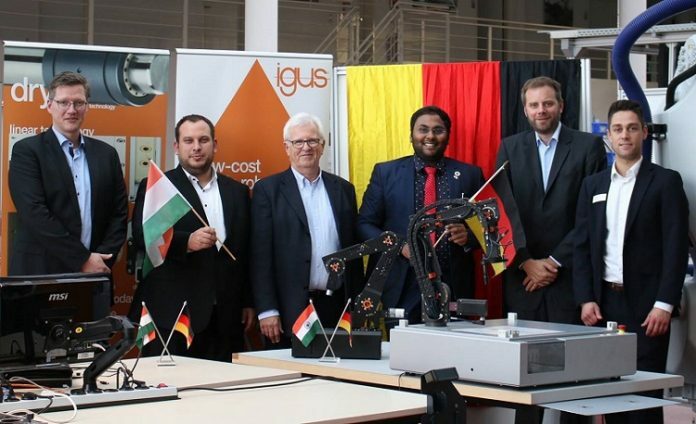 During a workshop in Aachen, professors from India gained direct, first-hand experience of how easy it is to use the low-cost robots from igus. The higher-education institutions are to learn how simple automation tasks in industry can be performed with the robot arms. 40 Indian educational facilities are each to receive two robots: the robolink DCi with four axes, integrated control system and electric magnets, as well as a robolink robot arm with four axes and pneumatic suction cups. In the framework of a delegation trip, 24 Indian professors familiarised themselves with the robolink systems. The trip was organised by APS GmbH. The company has dedicated itself to the transfer of robotics knowledge and research between the countries. The professors were trained by the igus low-cost robotics experts, Alexander Mühlens and Kai Schmitz, during an event in the Aachen Digital Capability Center. Dr. Christian Meyer, the developer of the robolink DCi software from Commonplace Robotics, instructed the professors on how to use the intuitive software. “After additional Train the Trainer webinars, the trained professors will teach their students how robolink can be used in industrial applications”, explains Meyer. After only a brief explanation, the professors were able to define some movements of the robot and see their success live. Further projects such as the use of low-cost robotics in the area of textile technology are already being planned in conjunction with APS GmbH.